Brazil’s agenda to enhance integrity and prevent corruption is particularly critical in order to address a number of challenges facing the country’s public administration. The challenges include managing risks associated with innovation in public service delivery, achieving value for money and minimising waste in government operations and meeting the expectations of citizens regarding the conduct of public organisations.This report is the first integrity review of a G20 country undertaken by the OECD. It assesses the implementation and coherence of instruments, processes and structures to create a culture of integrity and to manage risks affecting the operations and performance of public organisations.The report analyses four main areas of focus : (i) promoting transparency and citizen engagement; (ii) implementing risk-based systems of internal control; (iii) embedding high standards of conduct; and (iv) enhancing integrity in public procurement. It is complemented by three case studies to highlight issues of integrity management at the level of individual public functions, organisations and programmes: the federal tax administration, the Family Grant (a conditional cash transfer) Programme; and the National STD/AIDS Programme. Over the past decade the Federal Government of Brazil has undertaken a series of reforms of its public sector. Enhancing public governance is a key element in the country’s political reform agenda. They aim at making government more cost-effective, improving accountability and preventing corruption. The OECD Integrity Review of Brazil focuses on Brazilian action in four key areas: promoting transparency and citizen engagement, implementing risk-based internal control systems, embedding high standards of conduct among public officials and enhancing integrity in public procurement. 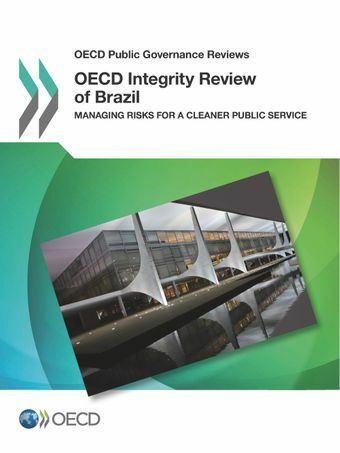 The review assesses the implementation and coherence of instruments, processes and structures to safeguard integrity within Brazil’s federal public administration. Make risk management a core responsibility of all public managers, rather than only a task for internal auditors. Managers should be empowered to identify and manage the risk of waste, fraud and corruption in their respective operations. Ensure that institutions and officials are capable of meeting their respective objectives, notably by providing necessary resources and training, continual assessment and sharing of lessons learned. Integrate currently fragmented assessment activities – now run by managers, inspectors, internal auditors, ombudsman, ethics committees and others – into broad management frameworks to support performance and promote accountability. Increase co-ordination to develop a collective commitment towards integrity reforms. Central integrity authorities could better work together when assessing and planning new initiatives to prevent waste, fraud and corruption or to modernise the public administration. Three case studies – on Brazil's federal tax administration, on the Family Grant conditional cash transfer programme, and on the National STD/AIDS Programmes – highlight significant differences in the implementation of integrity measures within public organisations. The case studies show that integrity authorities should provide more practical "how to" guidance and tools to improve performance in individual public organisations, parallel to government-wide initiatives. The OECD Integrity Review of Brazil is the fourth in a series of Public Governance Reviews in Brazil. It follows earlier OECD reviews on Human Resources Management in Government, in 2010, on Regulatory Reform, in 2008, and on Public Budgeting, in 2003. The OECD is currently conducting a peer review of Brazil’s Supreme Audit Institution (Tribunal de Contas da União), slated for publication in 2012. The report supports Brazil’s longstanding international anti-corruption commitments. Brazil has been a signatory to the OECD Convention on Combating Bribery of Foreign Public Officials in International Business Transactions since 2000. It was also one of the eight founding countries that launched the Open Government Partnership – a multilateral initiative to promote transparency, fight corruption and strengthen governance - in New York in September 2011.